Having last weekend represented Great Britain and Northern Ireland for the first time since his switch in allegiance from Sudan in 2013, Rabah Yousif is keen to pull on the GB kit again this summer. 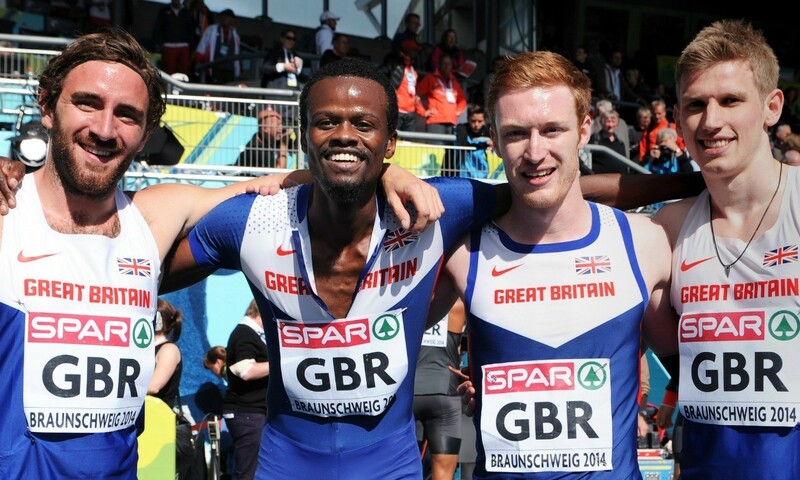 The 27-year-old ran the third leg of the men’s 4x400m relay at the European Team Championships in Braunschweig, Germany, on Sunday and was ecstatic to be back racing and a part of the team following injury problems last year. “It was a tough 2013 for me, struggling with injuries and losing a lot of confidence,” said the former Sudanese international (pictured above, second from left) who ran an estimated 46.6 as a part of a relay team also comprising Andrew Steele, Rory Evans and Jarryd Dunn in Germany. The GB team finished fourth with 3:03.44 at the team event but would have gone quicker had it not been for a messy third changeover. “My injury problem actually started in 2012,” explained Yousif. “I had a bit of a niggle in my hamstring about three weeks prior to the Olympic Games (at which he competed for Sudan). He equalled his PB of 45.13 in the Olympic semi-final but his hamstring problem returned in 2013. Now back fully fit, the Newham & Essex Beagles athlete has clocked a season’s best of 46.05 but says he knows he can go much quicker as he looks to run the 45.70 European Championships standard and compete well at this weekend’s Sainsbury’s British Championships in Birmingham. “I’m a tough man, I’m a competitor and I love doing this. I am healthy, I am ready to go and I can’t wait for this weekend,” he said. Yousif, who has lived in Britain since 2002, started out in the sport as a high jumper and has also long-jumped a best of 7.61m.